Food is such an important part of our daily lives, a representation of our culture, and a border-smashing commonality that is more easily shared than anything else. Yet, food seldom takes center stage in a role-playing game. The Culinary Magic Cookbook: Everything you need for cooking with magic! The Culinary Magic Cookbook, from Flaming Crab Games, gives you a unique way to spice up your game: a cookbook of edible spells. Compatible with the Pathfinder Roleplaying Game, the book lists almost 100 recipes, each with cooking instructions and magical in-game effects. Try Lektar’s One God ale keg beer bread for fortifying the body, flaming crab cakes for burning your enemies, or scroll dough as an alternative to scrolls and potions, to name but a few. To use the spells your character only needs a few ranks in Craft (culinary) and the Culinary Magic feat. It’s a worthwhile investment considering the sheer volume of spell-recipes available in the book. If you’ve ever wanted to play a halfling cook or a wizarding chef, there has never been a better time than now. The book comes in both Metric and Imperial versions, which is amazing. The pdf is 117 pages, with a back and front cover, 4 pages of OGL, and photos for every recipe. You can buy The Culinary Magic Cookbook on Drive Thru RPG and start cooking with magic today! The fine art of Goblin Lugging, enjoyed across our ancient realm by men and dwarves alike. Goblin Lugging is truly a valorous challenge of strength and grit. Goblin Lugging is more challenging with armed goblins! Each contestant grabs a goblin, then races through a series of obstacles. The winner is the first to cross the finish line with a goblin in their possession. Progress is measured in rounds for this challenge and the contestant to complete all the obstacles with a goblin in their possession in the fewest rounds is the winner. After the starter’s whistle, each contestant must grab a goblin by making a successful grapple (see the Combat chapter in the Pathfinder Roleplaying Game Core Rulebook). There is one goblin per contestant, kept in a small pen at the start of the course. Contestant must move along the course using the move action described under the rules for grappling. If a contestant fails a grapple, then they spend 1 round trying to re-catch their goblin. The Lake. This obstacle is 15-feet long. The contestant must make a DC 12 Swim check for each round they are in the water. On a failure, they make no progress. On a failure by more than 5, they can decide to either let go of the goblin and re-attempt the Swim check (DC 10), or they both go underwater. If a contestant’s goblin drowns they must spend 3 rounds capturing a new one. The Wall. This wall has random hand and foot holds, and requires a successful DC 15 Climb check to get over. Contestants holding a goblin suffers a –2 circumstance penalty on this check. It takes 3 rounds to climb over the wall. If the contestant succeeds on an accelerated climb (a –5 penalty), it takes only 1 round. Contestants failing the Climb check make no progress. The Slide. This slope has been turned into a muddy slide. Getting to the bottom is simple enough, doesn’t require a check of any kind, and takes 1 round. At the bottom of the slide the goblin gets to attempt to break the grapple, with a +2 circumstance bonus for being drenched in slippery mud. See the goblin in the Pathfinder Roleplaying Game Bestiary. The winner of a game of Goblin Lugging is the first to cross the finish line, still holding their goblin. Enjoyed this game? Be sure to check out Welcome to Scarthey, which includes the sport of Cackle-Ball! The Last Laugh is Ours — Mwahahaha! Tales from the Laughing Dragon Inn is the latest publication from our friends at Wayward Rogues Publishing, and it’s a whopper (56 pages!). Inside you’ll find maps for the entire inn and everything you need to make it come alive, including NPC descriptions and an extensive menu. You can never have too many taverns and inns prepped for your game, so this is handy. But it gets even better, with five adventures, pitched at levels 4, 6, 6–8, 8 and 10. There’s plenty to satisfy horror fans, and Lovecraftian horror fans in particular. Even if you don’t use the adventures as written, there are some dastardly NPCs and terrifying monsters you’ll want to throw at your players. Okay, but I am biased, because I did write one of the adventures. But it’s a great one. One of my best so far. And this brings me to my tie in with this month’s RPG blog carnival theme; “At World’s End“. A cultist communes with a dark, forgotten entity, calling across the void of time and space. Moments later, he’ll fall to a hero’s blade. Our just hero might leave a little richer, might even defeat the foul spawn summoned by the now cooling cultist, but what of the dark entity? It is awake now, and its attention is focused, menacingly, on the world our hero calls home. 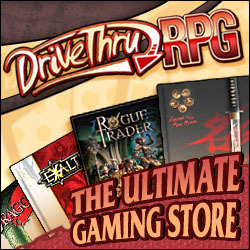 DriveThruRPG is having a massive Pathfinder sale, but hurry, it ends in a few days! Copies of the Claustrophobia! Beta rules are flying off the shelves and feedback is streaming in. My thanks to everyone who downloaded the book so far. It’s never to late to send in your feedback and I’m reading it all, keep it coming! An update is in progress, mostly rules clarifications at this stage. Remember that once you order the PDF, you can always download the latest updates from the DTRPG site, you don’t need to buy a new copy. More is brewing too. I’ll be on summer holiday soon and that will mean some interruptions, but hopefully I’ll deliver some juicy new content to you soon!